When I was young, a Daiquiri was rum, lime juice and sugar. Somehow, they have turned into a frozen Slurpee like concoction that is more like a dessert than a refreshing beverage. My friend invited me over and we returned to a simpler time. The recipe for the cocktail is at the end of the post. I juiced a lime. I put the lime juice and sugar in my cocktail shaker and stirred until the sugar was dissolved. Add 1/2 shaker of ice and the rum. Shake the rum until the shaker is cold and frosted. 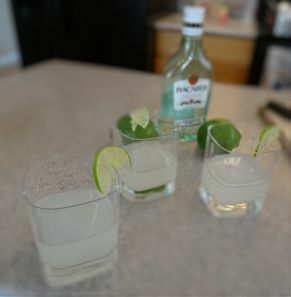 Strain the drinks into a small highball glass and garnish with a lime slice. These were way better than the frozen version. They were tart with just enough sugar to make it nice. The rum adds a crisp sweetness as well. If you want an adult drink that is refreshing, forget the Slurpees and make this. I have done a video on how to make this drink. Put the lime juice and sugar in a cocktail shaker. Stir until the sugar is dissolved. Add the rum and ice. Strain the drink into a small highball glass. I’m with you, Sam. Unless you are in a resort, no drink should have an umbrella!